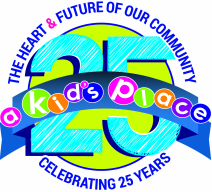 Our Mission Statement: A Kid’s Place is a not for profit organization that exists to provide a safe, developmentally appropriate environment for infant through school age children. Our focus is to provide a stimulating early care and educational experience which promotes each child’s social/emotional, physical and cognitive development. Our goal is to support children’s desires to be life-long learners. Our Predicament: The need for child care and preschool in our community has grown dramatically in the last several years. Our recognition of this need prompted us to expand our program to a second location for our school age children and to rearrange our current facility to accommodate an additional toddler room. After making these changes, we currently have 133 children enrolled in our program. Our waiting list for services has been consistently high for the past few years, currently at 65 children. In our last fiscal year ending 12/31/2015, for every $1.00 of tuition we received from our families, we had $1.17 of expenses to maintain our program. We depend on federal subsidies, grants, fundraising and contributions to make up the difference. Since 2010, the number of jobs our program has created has quadrupled. We currently provide meaningful employment for more than 30 local community members. Child care services decrease employee absences by 20-30% and reduce employee turnover by 37-60%. U.S. companies lose $3 billion annually as a consequence of child care-related absences.1 A Kid’s Place takes pride in providing consistent programming for our families in which our doors are always open with the exception of observed holidays and weather-related state of emergencies. This enables our parents to be a productive part of the workforce. A Kid’s Place received a gold award from the Child and Adult Care Food Program for implementing important health policies. We are committed to ensuring all children receive daily physical exercise and are offered only nutritious meals. This commitment extends beyond the children in our care. During this past summer, we served over 2,700 free meals to local children as part of the Summer Food Service Program through the state of Indiana. 2 Shonkoff, J. & Phillips, D. (2000) From Neurons to Neighborhoods: The Science of Early Childhood Development Natl. Acad. Press, Washington, DC).